Popular from the 13th to the 17th century, small shields such as this Steel Domed Shield were preferred over full sized shields for their lighter weight and increased mobility. 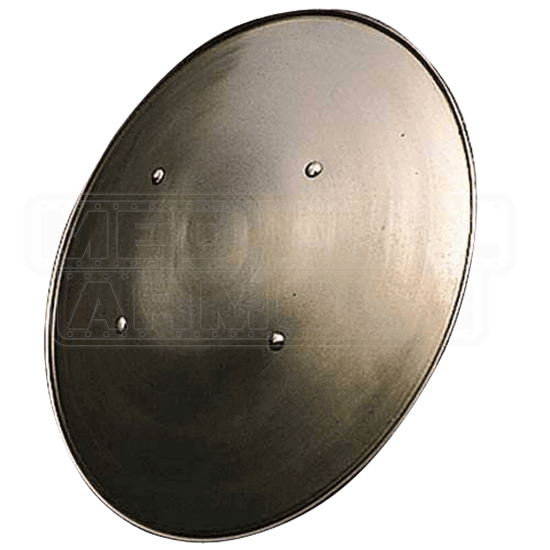 This functional round shield is made from 18 gauge steel. Perfect for LARP combat, capoferro fencing, and historical reenactment, this rotella has a rolled edge and riveted leather grips. The favored shield of Spanish swordsmen, known as rodeleros, the target or rodela helped Gonzalo de Cordoba and his soldiers defeat the Hapsburg Valois pike formations in the Italian wars. This Steel Domed Shield is an elegant shield for any Renaissance sword fighter.